Choice of 19 Degree or 30 Degree Beam Spread! A powerful, well-rounded entertainment fixture, the elektraLite 1018 Outdoor is ready to bring rich vibrant color to a strong white fixture. At the heart of the elektraLite 1018 Outdoor are eighteen powerful 12-watt quad LED’s, consisting of a red, green, blue, and white component. The elektraLite 1018 Outdoor is designed to deliver rich, vibrant colors you expect from an LED fixture, while still providing true, brilliant white. By mixing color internally, the 1018 Outdoor’s sophisticated diffraction lensing system provide true, blended, singlecolor output. Because of this, the white is perfectly blended and balanced at 5,600K, so as not to emit a blue-white so often seen in LED fixtures. 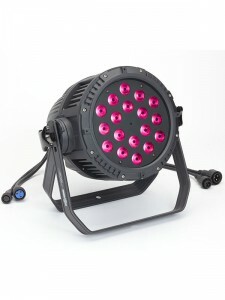 By having true white built in to the LED emitter, and because it carries the IP65 wet location rating, the elektraLite 1018 Outdoor is ideal for a wide variety of entertainment spaces including outdoor stages, outdoor galleries and gardens, exterior architecture features, and location shooting.